One miracle on top of another! 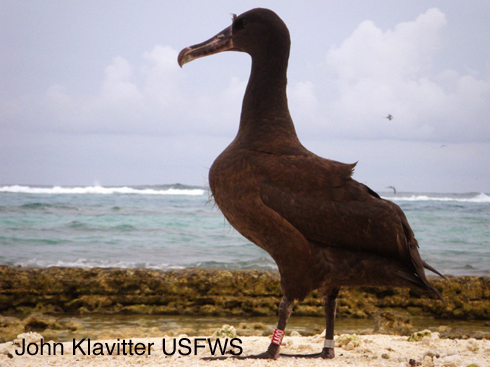 In January 2011, a pair of Short-tailed Albatrosses produced their first chick on Midway Atoll. Never before had this endangered bird bred outside of Japan. But in March, while the parents were foraging at sea, the tsunami that struck Japan also reached Midway, washing the chick off its nest. Miraculously, it survived and has now departed the island. It will be six years before the young bird reaches nesting age. Perhaps then it will return to Midway, accompanied by a mate. Learn more at ABCBirds.org. Short-tailed Albatross Chick Fledges on Midway - After Surviving Tsunami! We have new reason for hope for one of the world’s rarest seabirds. In June 2011, American Bird Conservancy reported that a single Short-tailed Albatross chick fledged from a remote island in the Hawaiian chain. This endangered bird had never before bred outside Japan. It’s a true story that reads like a suspense thriller. Short-tailed Albatrosses, once more than a million strong, were so hunted for their plumes a century ago, that they were thought to be extinct. Then, in the early 1950s, ten pairs were found nesting on an island in Japan. The problem is the island the birds chose is an active volcano. A single eruption could wipe out the species, now numbering about 3,000. But a few years ago, a pair of Short-tailed Albatrosses was seen at Midway Atoll, at the northwest tip of the Hawaiian archipelago. And in January of 2011, the albatross pair produced their first chick. But in March, while the parents were foraging at sea, the massive tsunami that struck Japan also reached Midway, washing the young chick off its nest. Miraculously, it survived. The parents returned to feed it, and now the chick has fledged and departed the island. We’re keeping our fingers crossed. It will be six years before the young bird reaches nesting age, but perhaps then it will return to Midway – accompanied by a mate. Calls of the Short-tailed Albatross provided by naturesound.org. Read article: "First Short-tailed Albatross Born In U.S. Fledges"
Divorce among albatrosses? New York Times says "Not so much!" Short-tailed Albatross (Phoebastria Albatrus) Sep 17 2017, Off Aomori Pref.